24/6/2018 Just in time for the summer solstice, I spotted my first field scabious of the year on the wide field verge at The Hobbets. This is a flower that takes me instantly back to childhood, to bike rides and walks with my father, and to the look of glee on his face when he would ask us the name of the flower. Though he tested us on many flowers, trees, butterflies and birds, for some reason it is this flower that sticks in my memory. I think it must have been the one he tested us on most frequently; perhaps because we were bad students and kept forgetting its identity, or perhaps because he particularly loved it. And, judging by the way he said it, I suspect he also delighted in the sound of its name. 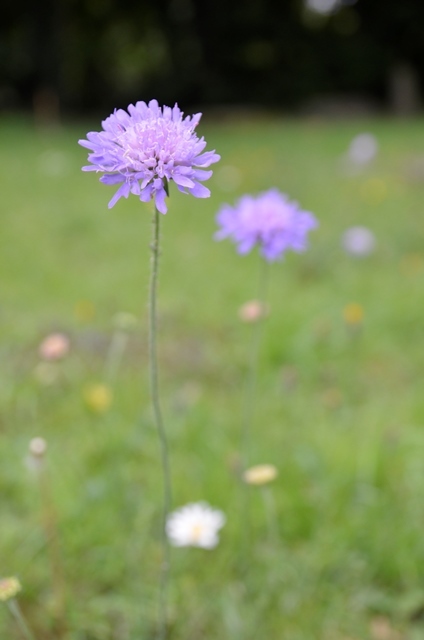 These associations along with its beauty and popularity with bumblebees mean that I have inherited his love for the field scabious. But now I have become aware that this explanation barely touches on the truth. The truth is that I look at the field scabious and I see my father. Loving the flower is almost indistinguishable from loving him. Realisation has come late, but what a wonderful and comforting thing it is to understand, finally, that I can find my father in a flower. 21/6/2018 I am so late with my last two spring treasures that they have spilled over into summer. I mustn’t use this as an excuse to abandon them though; they have been flitting around in my head, even if they have not alighted until now. 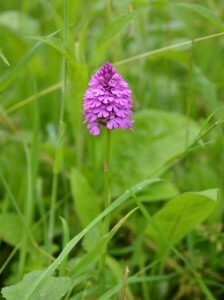 I thought pyramidal orchids would be my choice of penultimate spring treasure. They grow in my wildflower meadow – though I have only found one so far this year – and there is a forest of them at the Hobbets. In the end, however, I realised it isn’t just the orchids I love, it is their context: the sheer abundance of them at the Hobbets amongst the oxeye daisies, meadow vetchling and black medick. What’s more, there isn’t just one species of orchid there, but two. At first I thought they were a variation of the pyramidal orchid – which is known to range in colour from pale pink to deep pink-purple – but now I know better. They are marsh orchids. To my shame, I haven’t yet identified which type of marsh orchid they are, but I will make the time this very week and take along my plant identification guide. 16/4/2018 Richard Jeffries suggested the skylark should be considered a representative of winter: instead of cold and darkness, he thought, why not ‘a sign of hope, a certainty of summer?’ It was his essay that helped me to think of winter in a different way. I half expected to include the skylark in my winter treasures; after all, I have heard skylarks sing over the fields around the Hobbets on many a clear, mild day in February. It just happens that I didn’t hear one until April this year. It is likely I simply wasn’t in the right place at the right time; but the longer wait and the circumstances of my first skylark song were part of what made it so special. During my literary meanderings, from Ronald Blythe to Hugh Farmar to George Peterken, I discovered several details about the Thicks that I hadn’t yet found out through visiting it myself. 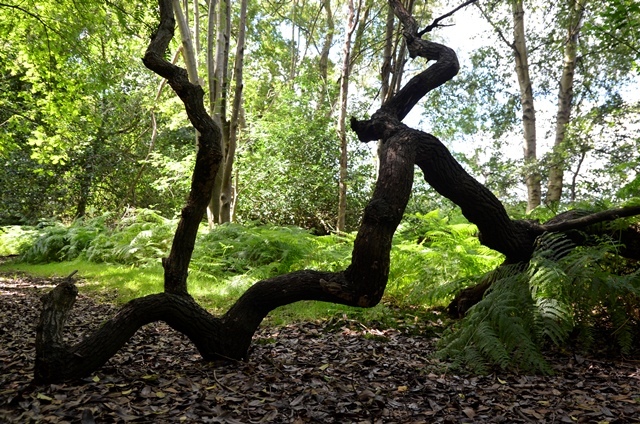 Aside from the fact ‘Staverton’ means ‘staked enclosure’ (Blythe, 2013), and that it contains or contained what was thought to be the tallest holly tree in the UK (at 22.5 metres in 1969), I read about Butley stream and possible marshes or wetland to the northeast of the Park, and Butley Priory approximately a mile to the southeast. Founded in the 12th century, the Priory was once the owner of the Thicks. Only ruins and the Priory Gatehouse remain, both marked on my Ordnance Survey map. Lastly, the cottage Hugh Farmar lived in, Shepherd’s Cottage, was not the one along the road to Butley I first took it for when I saw his photograph of it: there was another, almost identical, thatched stone cottage in the northeast corner of Staverton Park, a mile or so from any road. 20/7/2016 Thirty degrees, tropical downpour. Thunder and lightning with a 45-degree battering by ice bullets. Taking shelter behind a bush not tree in case of lightning. The storm passes; swimming in steaming bath water surrounded by disappearing white peas. The geese stare. Slate grey horizon one side, blue sunshine the other. A swallow chasing a sparrowhawk chasing a barn owl. 11/6/2016 Part 2 of The Hobbets is now up on Caught by the River! Part 1 here. 15/5/2016 I’m thrilled that Caught By the River are running The Hobbets! Part 1 here. 28/8/2015 Today the first leaves and twigs are on the water, from the wind in the night. I’m used to swimming with only the odd feather floating on the surface, and the occasional nibble from a small fish when I wade in. The carp, some up to a foot long, are swimming fast just under the surface, creating V-shaped ripples behind them: even though they are small, my mind immediately leaps to sharks. I sit and watch them for a while, wondering why they are in such a great hurry, changing direction, some this way, some that, with no pattern that I can determine.